The Winchester Model 1894 or Model 94 Lever Action Rifle was a product of US Patent 524702, which was designed by the great John Browning. The major advancement with this firearm was that it was the first repeating rifle to handle smokeless powder cartridges. This made for a more reliable, dependable and quick rifle. To this very day, the Model 94 is one of the most popular firearms in the world. There are more than seven million Model 94 rifles out there. 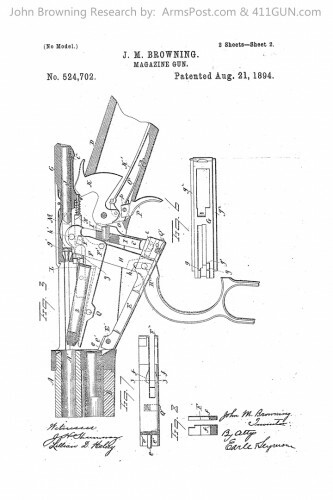 US Patent 524702 for the Winchester Model 1894 was applied for by John Moses Browning on January 19th, 1894 and granted that same year on August 21st, 1894. 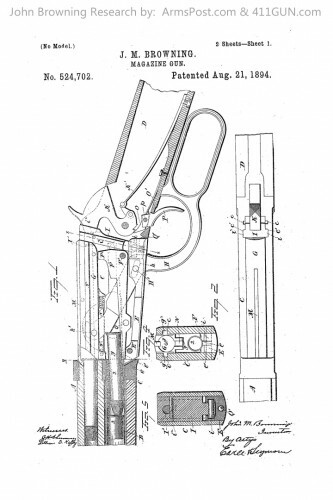 Though it may have been designed to handle smokeless powder cartridges, one of the early cailbers of this rifle was .38-55, which, at that time, was a blackpowder cartridge. Subsequently, Winchester has produced several commemorative versions of the awesome Model 94 rifle in .38-55, like the beautiful 1983 Chief Crazy Horse i was given box as a High School graduation present in 1986 – originally purchased new in box from a gun store. These subsequent commemorative .38-55s utilize a smokeless cartridge currently available from Winchester in 255 gr. No CAAD, no tablet…just pencil and paper. JMB was a genius.